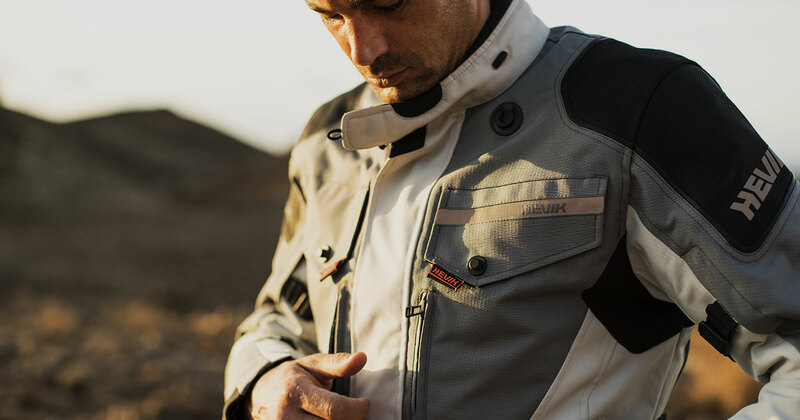 As experienced motorcyclists will know, it is essential to have a versatile jacket that can guarantee maximum protection while riding through varying temperatures and weather conditions. The Titanium jacket by Hevik is the perfect year-round choice. Its three layers, with detachable thermal padding, make it as easy to cope with a cold spell as it is a hot summer’s day. In addition, the internal membrane, also detachable, is both breathable and water resistant with a high waterproofing value (up to a 7000ml column of water), features which make the Titanium extremely useful when caught off-guard by a sudden downpour while on the move. In addition, the Titanium jacket has large waterproof pockets, all of which have been added into strategic points on the garment. There are seven pockets in total: two inside the jacket, four in the front area and a wider one located in the lumbar region. To guarantee optimum ventilation, seven air intakes are positioned uniformly over the entire surface of the jacket; three on the back, two on the chest and two on the sleeves. The Titanium benefits from a short, practical cut designed specifically for periods spent in the saddle and it boasts hook and loop fastening adjustments on the sleeves and on the waist. The Titanium jacket is also designed to provide maximum protection in the event of a fall as it is equipped with protectors on the shoulders and elbows and allows for the insertion of the three-layered Hevik H-Full Back-Armor. Safety does not mean sacrificing style as the Titanium stands out for its clean lines and attention to detail, recognizable both in traditional black and eye-catching grey/white. The look is completed with the Terrain technical trousers also by Hevik, equipped with a special zipper at the waist for attaching to the matching jacket. Versatility, practicality and style make the Titanium jacket by Hevik, a must-have for all those who have a passion for two wheels!